Epithelium: exocrine and endocrine gland. Atlas of Plant and Animal Histology. This image is from pancreas. Organ:: Pancreas, endocrine and exocrine gland (mixed gland). Pancreas contains both, exocrine and endocrine secretory parts. That is why it is called a mixed gland. The exocrine secretory part consists of serous acini (known as pancreatic acini), whereas the islets of Langerhans form the endocrine part. 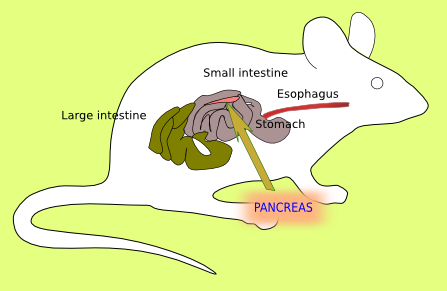 The major part of pancreas corresponds to the exocrine part (98-99 % in humans). The serous exocrine cells show a rounded nucleus and dark cytoplasm. The cytoplasm is more clear in the apical part because of the higher density of secretory zymogen granules containing digestive enzymes (zymogens are inactive enzymes or proenzyme). Abundant rough endoplasmic reticulum is localized in the basal cytoplasm of serous cells, where enzyme precursors are synthesized. Inside of serous acini, there are weaker stained cells which are named centroacinar cells. They form ducts to collect the secretory substances released by serous cells. These acinar ducts join together and form the interlobular ducts, which in turn flow into the hepatic ducts, that finally release the pancreatic secretory products into the gut. There is no myoepithelial cells around the pancreatic acini. The endocrine part of the pancreas is a set of cell groups which are known as islets of Langerhans. They are distributed among the exocrine acini. Islets of Langerhans are highly irrigated by blood vessels that get and distributed the hormones released by the islet cells. 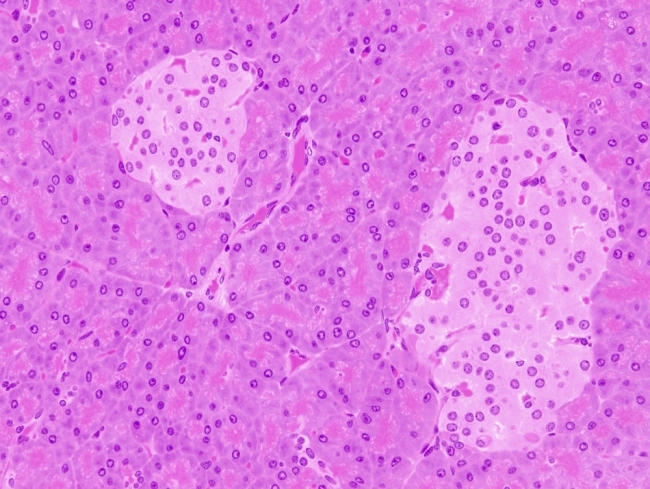 Although it is difficult to discern using common staining techniques, there are several types of cells in the islets of Langerhans: alpha cells (release glucagon), beta cells (release insulin), gamma cells (release somatostatin) and F cells (release pancreatic polypeptide).